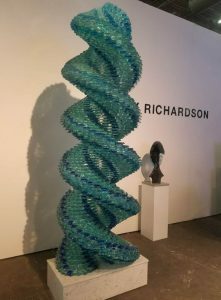 As an experienced fine art shipping company in NYC, we can say with confidence that moving fine art in New York is impossible without providing comprehensive art installation services. At Fine Art Shippers, we specialize in the bespoke installation of art both outdoors and in the buildings, which allows our team of trained art handlers to work with various art institutions, museums, galleries, auction houses, collectors, artists, and exhibitions of any kind. Our passion for moving fine art in New York and our customized art installation service have made Fine Art Shippers the number one choice for many art business professionals and private clients not only in NYC but across the United States too. Fine Art Shippers has been moving fine art in New York for 20+ years, and we pride ourselves on providing a world-class service tailored to meet the needs of our clients. From picking up art to manufacturing custom wooden crates, every single step of the art and antique moving process is done in-house by our qualified team of experienced art shippers and crate makers. We never outsource our work to any third parties, and we take responsibility for the transportation of our clients’ possessions from door to door. Plus, Fine Art Shippers is one of a few companies providing professional same-day art delivery services to the art community. In other words, if you need any urgent help with moving fine art in New York, you won’t find a better option than our team of experienced art handlers! 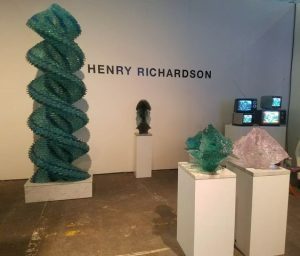 As it has been already said, moving fine art in New York is impossible without providing comprehensive art installation services. 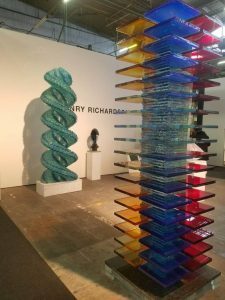 For example, not so long ago, Fine Art Shippers was chosen to move a collection of incredible glass sculptures by Henry Richardson from Lee, MA to New York for the Architectural Digest Design Show that took place in March. However, our job would not be complete without expert art installation. Everything was done perfectly and in a timely manner. 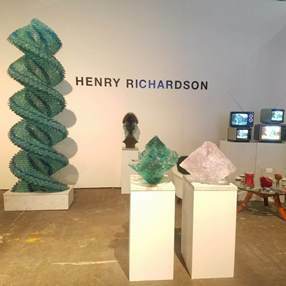 As a result, Henry Richardson’s booth was among the best at the Architectural Digest Design Show 2018. Here are several photos from that amazing presentation. Whether you are looking for reliable art handlers specializing in moving fine art in New York or need professional art installation services, Fine Art Shippers is always the right place to come for help. Moreover, you are sure to love our affordable prices!